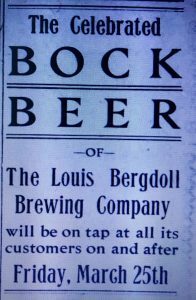 The Louis Bergdoll name was associated with the brewing industry in Pennsylvania for approximately 70 years, beginning in the mid-1800’s and continuing up until the advent of Prohibition. 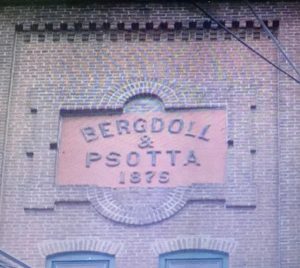 Bergdoll’s brewery, sometimes referred to as the City Park Brewery, gained fame for its lager beer which was produced utilizing water from artesian wells. Mr. Bergdoll was born in Seusheim, a little town near Heidelberg, in Baden, and after acquiring a thorough knowledge of the beer brewing business came to this country late in the forties. 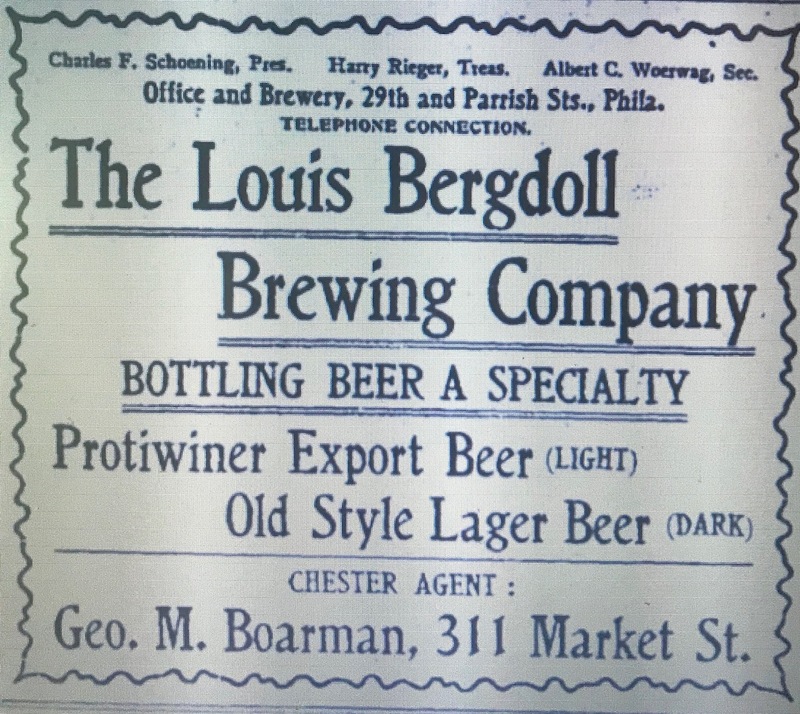 A feature on Bergdoll, published in the October 6, 1908 edition of the Philadelphia Inquirer stated that the business started out under the name of Bergdoll & Schemm and, in 1849 the partnership established the original brewery at 508 Vine Street in Philadelphia. An item printed in the November 24, 1849 edition of the (Philadelphia) Public Ledger indicated that they also maintained a retail location close by at 178 Vine Street. The next year Schemm left the partnership and turned it over to Bergdoll’s brother-in-law, Charles Psotta. The company would operate as Bergdoll & Psotta from 1850 until Psotta’s death in July, 1877. At some point in the mid-1850’s the company began to transition operations from their Vine Street location to newer, larger quarters. A 1979 application to register several remaining buildings associated with the brewery complex on the National Register of Historic Places picked up the story from there. In 1856 the firm of Bergdoll & Psotta in need of more commodious quarters abandoned the plant on Vine Street and began the development of a new complex located in the still existing buildings in the block situated on the east and west sides of 28th Street, between Brown, Parrish and Poplar Streets.The site of the plant was chosen primarily because of its location near Fairmont Park and the Schuykill River. The original brewing house was erected in 1856 and consisted of a 3 story dwelling house for Mr. Bergdoll, a brick and stone fermenting, cooling and storage section, and a one story fermenting and distilling building of stone and brick with a slate roof. …on the original space stands a five story brew house whose two kettles have a capacity of 88 barrels, a six story malt house, with a capacity of 200,000 bushels, an elevator, boiler house, stables and ninety houses for workmen. Every part of the plant is constructed of stone, iron and brick, being fireproof throughout. There are four ice machines with a capacity of three hundred tons of ice. Recently a smoke stack 70 inches in diameter was erected to the height of one hundred feet to make the necessary draft for the additional power used to drive two engines and two dynamos that supply electricity to the plant. A modern machine shop is in operation and a complete fire department equipped, the water being supplied by a standpipe connected with water pumps. The plant now employs more than two hundred men and the annual output is about one hundred and seven-five thousand barrels. 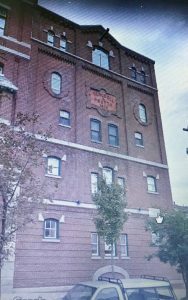 According to the Philadelphia Inquirer feature Bergdoll, along with his two sons-in-law, Charles Schoenning and John Alter, incorporated the business as the Louis Bergdoll Brewing Company, on October 3, 1881. Bergdoll served as the first president. Schoenning was secretary and superintendent of the works and Alter was treasurer. Bergdoll’s son, Louis Bergdoll Jr. was the brew master. After Louis Bergdoll’s death in 1894 the brewery remained closely held by the Bergdoll family with Peter Bergdoll Jr., Joseph Alter, Charles Schoenning and Bergdoll’s widow, Emma, all serving as president at various times. Their “Celebrated Bock Beer” was apparently seasonal and was advertised as being available on tap each year sometime in March or early April. Both advertisements shown below were published in the local Philadelphia newspapers. The first, from 1896, is one of the earliest I could find. The second was one of the later ones, from 1910. In addition to advertisements in the newspapers, on at least two occasions, 1912 and 1914, they sponsored a unique event at a local Philadelphia theatre where they challenged Harry Houdini to escape from a vat filled with their beer. 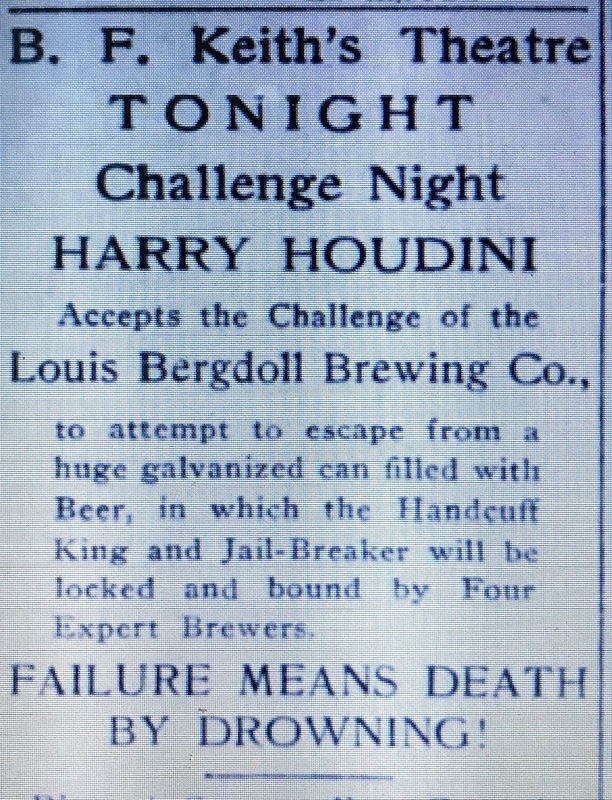 Houdini accepted the 1912 challenge in the January 10 edition of the Philadelphia Inquirer. It was also in the early 1900’s that the company was transitioning their delivery methods from the horse to the motorized truck, putting their first delivery truck into service on June 17, 1903. 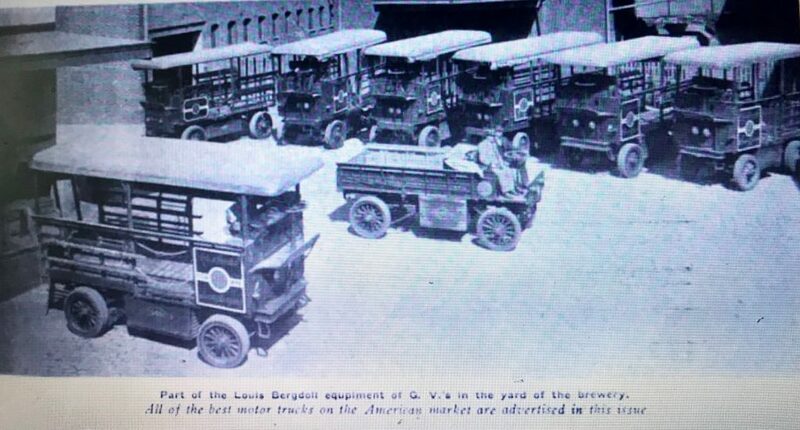 In fact, an article in the February 1, 1913 edition of a publication called the “Power Wagon,” stated that Bergdoll was the first company in Philadelphia to successfully deliver beer using a truck in lieu of horses. This resolve taken, officials of the company went to New York and bought a 3-ton General Vehicle truck. This was the first successful electric vehicle used in beer delivery in Philadelphia, and when it first appeared on the streets it attracted more attention than an airplane would now. The article went on to describe the company’s fleet in 1913. Thirteen of the 15 trucks used by Bergdoll are electric, nine of the General Vehicle make, and four the output of the Commercial Truck Company of America. There are also two 3-ton Mack gasoline trucks. The firm still retains a small number of horses, but these are worked only in a radius close to the brewery. For the heavy hauls, the 5-ton trucks are used. The 3-ton electrics do the middle distance work, and the gasolines make runs into the suburbs. The gasolines are used with excellent effect on runs like that to Germantown. It is possible for one of the 3-ton Macks to do a service that would require on the average from six to eight horses. The truck can start out at 7 o’clock in the morning, make the long run to Germantown or Chestnut Hill, and be back at 11, four hours later, ready to tackle another extended trip in the afternoon. A pair of horses used on this route would pull ten less barrels, take eight hours, come back tired out, and have to be rested the next day. Bergdoll makes his own current, and does his own charging. Figures kept by the chief of Bergdoll’s garage show that the 3 1/2 and 5-ton electrics give a mileage of about 6,000 miles a year, and the 2-ton trucks give 7,000 miles. A photograph of several trucks parked in the Bergdoll yard was included with the article. By the mid to late teens the brewery was feeling the impact of the temperance movement and impending Prohibition. According to a story in the September 7, 1918 edition of the (Philadelphia, Pa.) Inquirer, the brewery was still operating at that time but was certainly being threatened by President Woodrow Wilson’s decision to exercise his wartime authority to prohibit the manufacture of beer after December 1, 1918. The Louis Bergdoll Brewing Company continued to be listed in the Philadelphia directories up through 1922 at their 28/29th Street address. In the 1923 directory the name of the company changed to the City Park Brewing Company. Owen J. Roberts representing Hall, said that the company had ceased operations in 1923, when the plant had been closed. 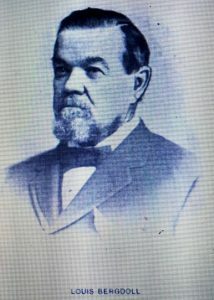 J.R. Breilinger, for the company, contended that the concern was doing a real estate business and added that Hall’s efforts to distribute assets was more on the part of a minority holder to force the hand of the majority. Judge McDevitt then asked if the brewery was not dead legally, to which Breilinger replied that, by making beer one day a year, they would establish their legal existence. Ultimately the Bergdoll family sold the brewery in June,1929. The sale was announced in the June 26, 1929 edition of newspapers across Pennsylvania. Mrs Emma Bergdoll…signed the papers turning the plant over to G. M. Slade. The purchase price was not disclosed. The vast Bergdoll fortune was amassed in the manufacture of beer in the old brewery prior to prohibition and the days of the World War. 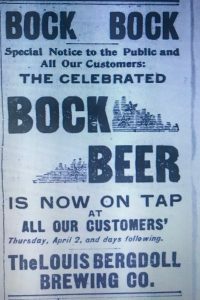 At the end of Prohibition, a March 23, 1933 item in the Philadelphia Inquirer under the headline “Breweries, Hotels Plan For Big Day” indicated that the plant was being refurbished in anticipation of the April 7, 1933 date when 3.2 beer sales would again be legal. Ultimately a September 6, 1933 item in the (Scranton, Pa.) Times-Tribune announced that the company had been granted a 3.2 beer permit. Interestingly, the permit was awarded under the Bergdoll name and not the City Park Brewing Company. According to various internet sources the company brewed beer for a short time in 1933 and 1934 before shutting down for good but I haven’t been able to confirm this. The bottle I found is a brown export style with the embossing “Louis Bergdoll Brewing Company, Phila.” Machine made it was likely made in the decade prior to Prohibition.